← Jeff & John – my heroes! 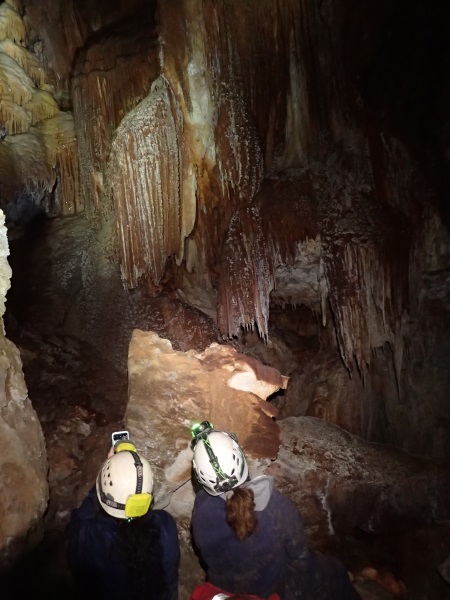 Caving at Yarrangobilly would be Marcia’s first experience of wild caving! Marcia, David and I drove down on Friday via Gunning, stopping at the Marino Café where David caught up with his favourite Café owner, Rea (delicious food). 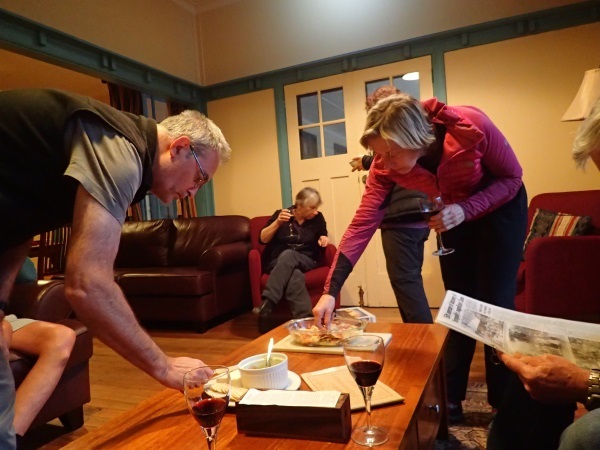 We arrived at the Yarrangobilly Visitor Centre around 4pm, picked up our permits and keys to the caves and headed over to the West Wing to settle in. Before long Heather arrived and then Regina popped in to let us know that Llewellyn wouldn’t be able to make it as he was sick, another Canberra SS member, Chantelle joined us for the Saturday and Sunday. 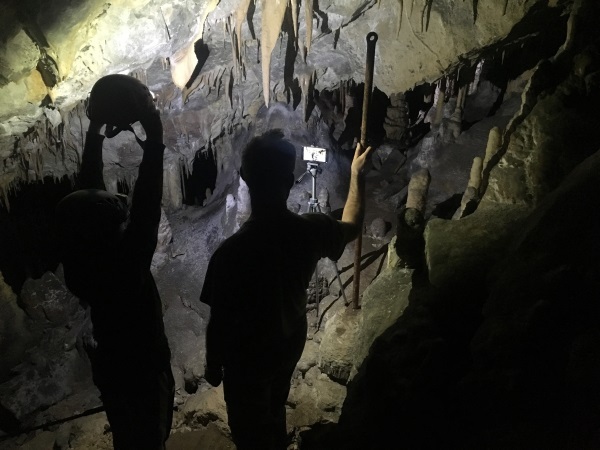 On Saturday we headed off to a couple of show caves Castle (Y31) and Harrie Wood (Y26), Regina and a young friend from Talbingo and CSS member (Daniel) joined us. It was really cold when we started out, drips from the cliff above were falling down on the snow grass and freezing! 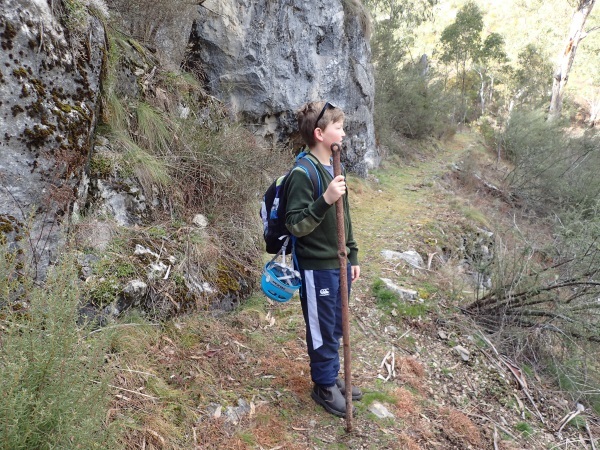 Daniel on the track with a metal stake that we found out the front of Grotto Cave, we walked it to Castle Cave where it would be left inside the locked gate away from vandals. 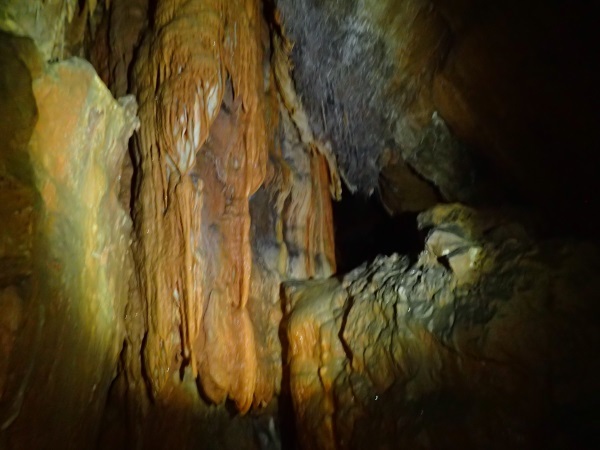 One of my favourite formations in Castle Cave, the straw pendulite (centre of photo). 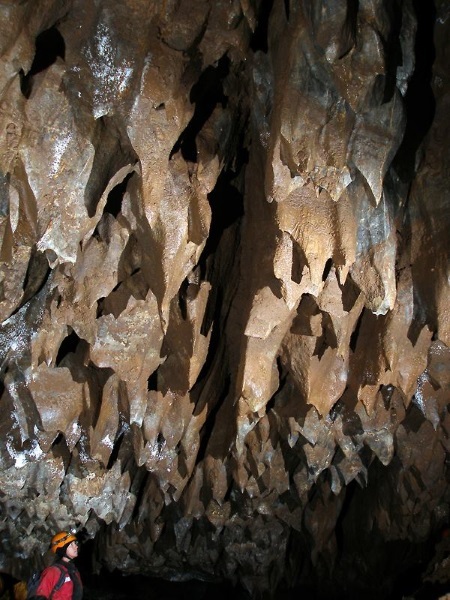 Photo David S.
Harrie Wood cave, in the “old days” all the formations were protected from vandalism by metal stakes with chicken wire forming a tunnel through the cave. 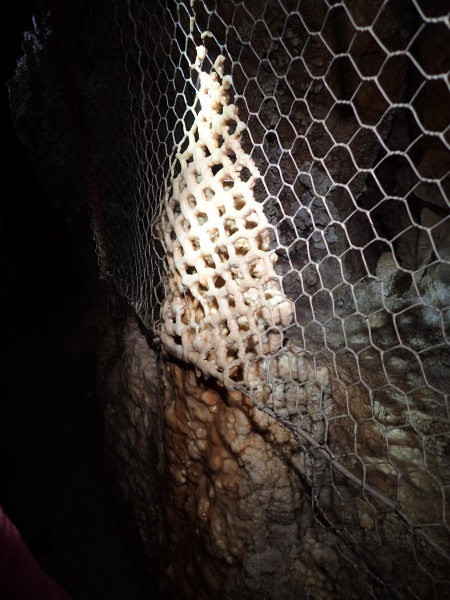 As one of it’s “projects”, MSS members dismantled these unsightly barriers, but some were left because the calcite had adhered to the chicken wire, as in this case. Fascinating how quickly it’s formed. 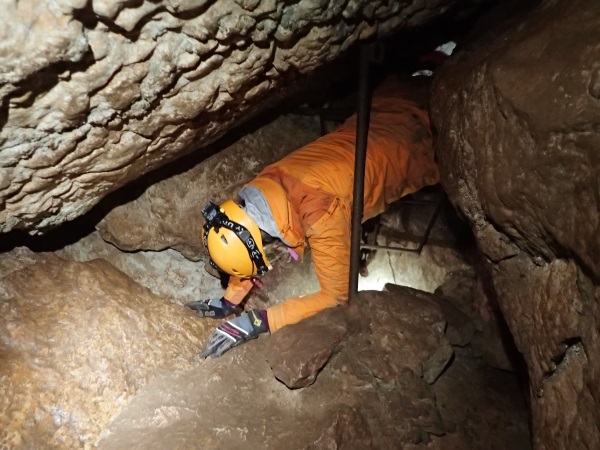 Some of us took the show cave route through South Glory and then we headed back to the West Wing where Steve R joined us and Heather whipped up a lovely chicken laksa for dinner. 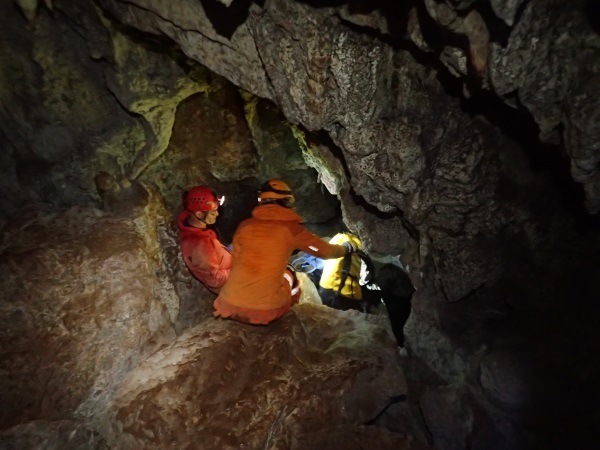 On Sunday, we set off to visit The Restoration Cave (Y50). 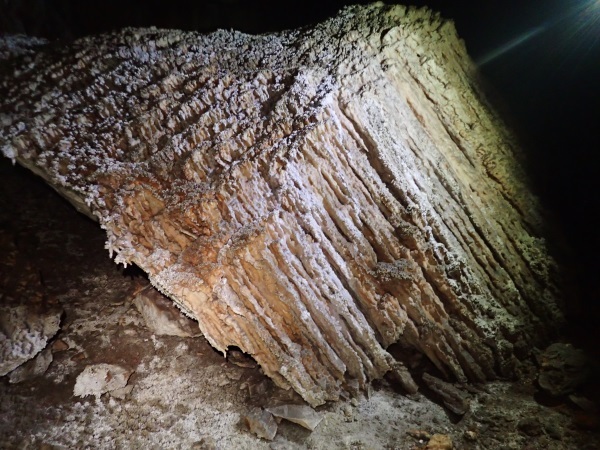 Interesting story about Restoration Cave, apparently it was discovered by a SUSS group in 1960, roughly on the 300th anniversary of the restoration of the English monarchy when the English, Scottish and Irish monarchies were all restored under King Charles II. 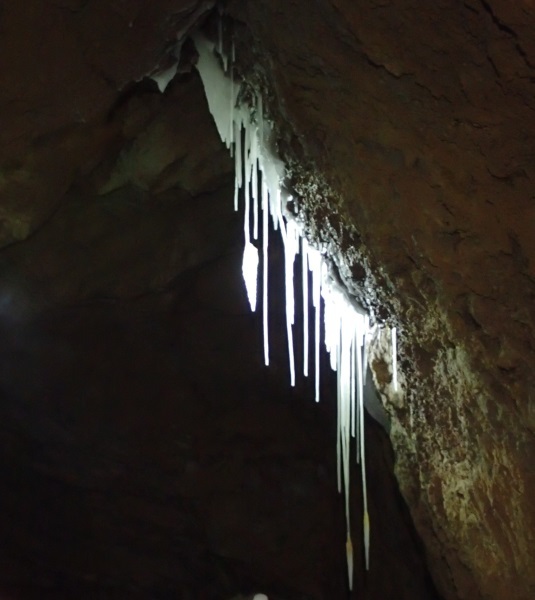 The cave was therefore named The Restoration Cave but over the years the “The” has been dropped. 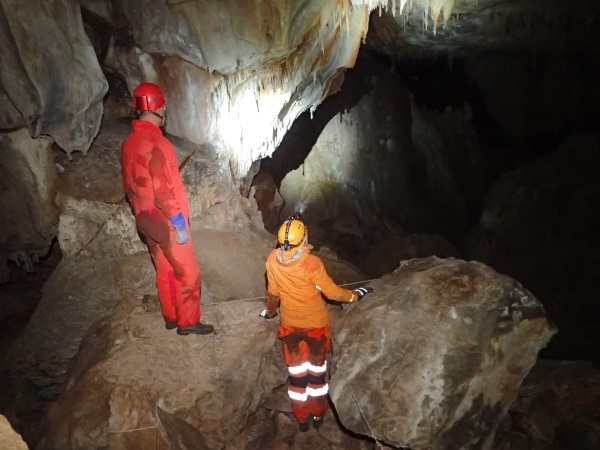 Restoration Cave would be Chantelle and Marcia’s first experience with wild caving (ie anything other than a show cave). We drove to the start of the track and headed in – a bit scrubby and lots of blackberry (should have put my gloves on!). 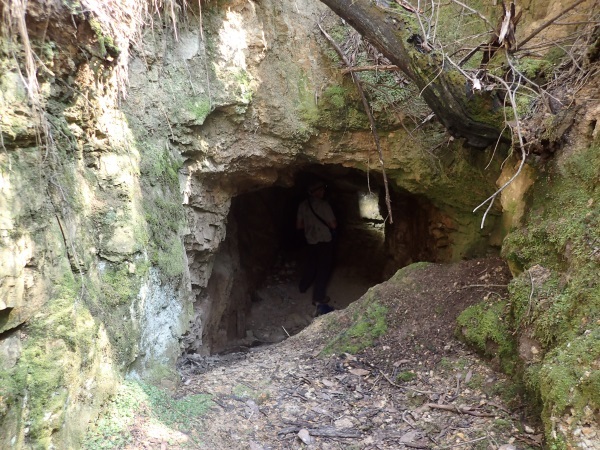 We were soon at the cave entrance and David sent those that hadn’t done the cave off to look for the way in. A muddy slope and some tricky downclimbs and we were soon at the first level. 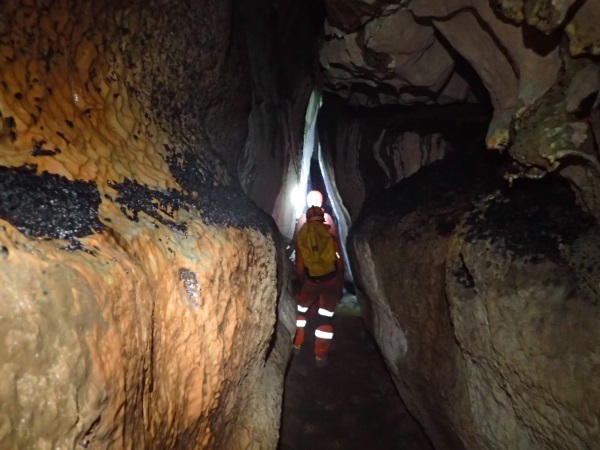 A lot of track marking has been put in place to encourage cavers to stick to one route and not run the risk of bumping into any formations. 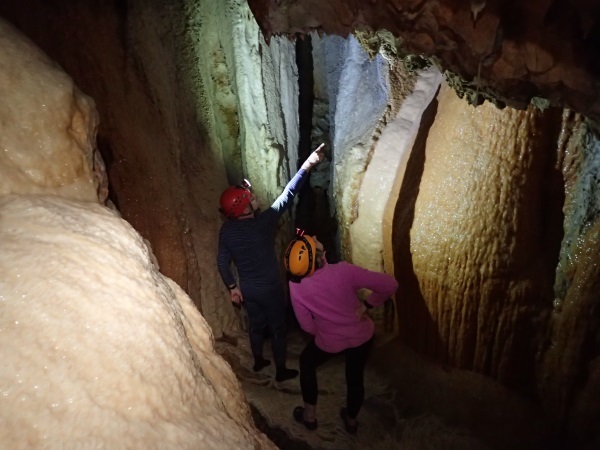 Marcia and David at the end of the marked route, admiring the magnificent straws on the ceiling. When you’re on the marked route (there are lots of no-go zones), your camera doesn’t do the straws justice. This photo is from many years ago when the no-go zones weren’t marked, it looks like David is close to the straws but he really isn’t as the photo is taken from above. This gives you an idea of how long the straws are. They’re really fragile and just breathing on them might be enough to break them. (Photo: David S collection). Our group, Marcia, David, Steve, Regina, Chantelle and Heather on the upper level. On our way to the lower level. I hadn’t been in this area before as the climb-downs freaked me out last time, but I persevered this time, knowing that Steve would be able to push me up the climbs on the way out! 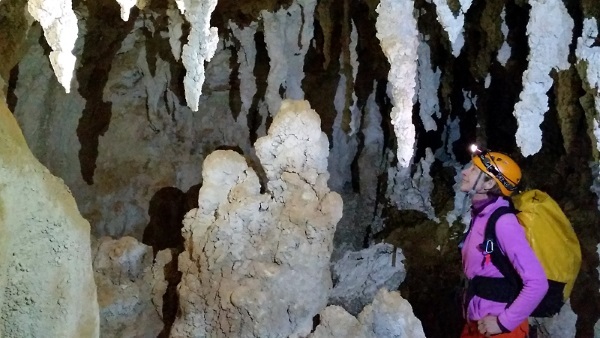 Chantelle and Heather admiring some of the formations. This one had fallen down from the ceiling many years ago. 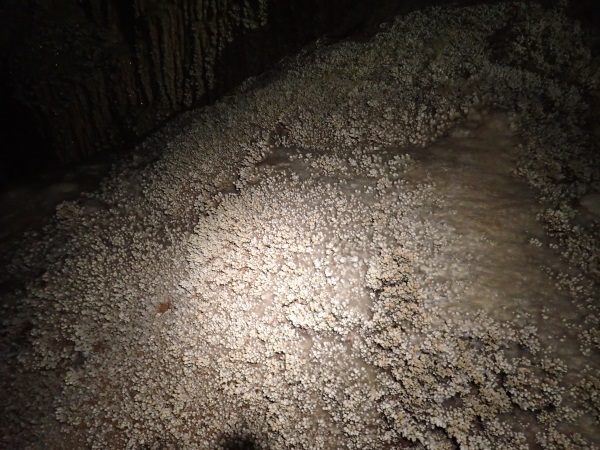 Flow stone covered with cave coral. Walking back from the end; again, the route is marked so you don’t tread on anything fragile. This photo gives an indication of how big the chamber is. 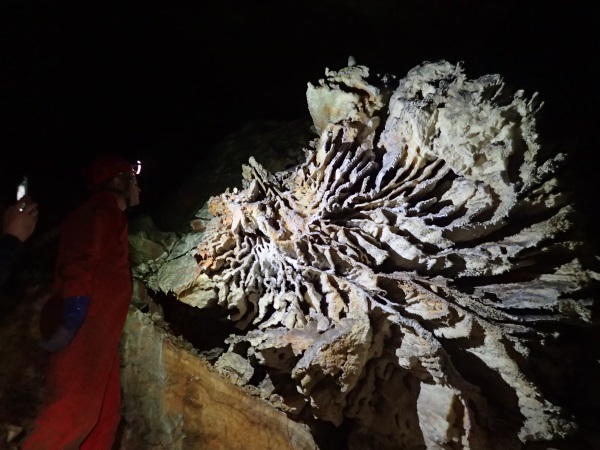 We missed this on the way to the end, it’s the bottom of a fallen formation and it was fascinating. Chantelle making the climb up look easy; being shorter, it was touch and go for me but Steve came to the rescue and pushed me up over the rock. 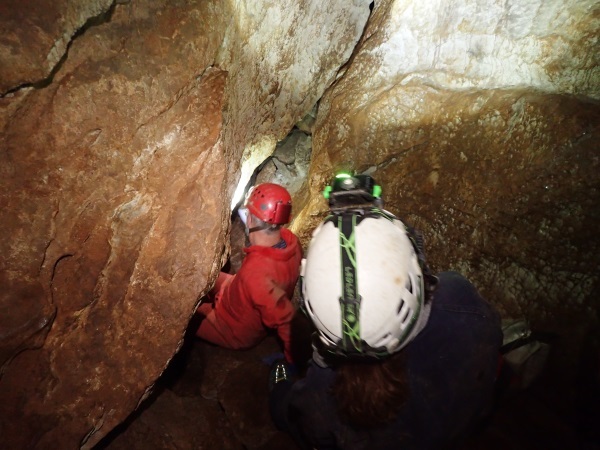 There’s a climb-down that’s really easy going into the cave as David had set up a tape as a hand-line, but then you have to climb up it going out. David had put a loop in the bottom to aid those of us who are vertically challenged. 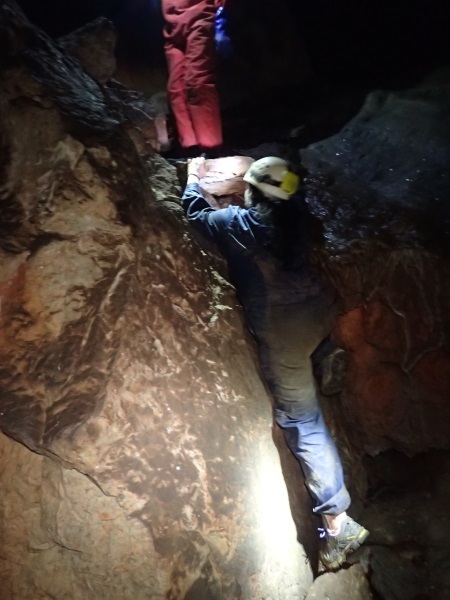 Chantelle again made it look easy, but I knew that it would be much harder for me, so I introduced David to the alternate MS route, it was ok until I got to the part where I had to get into a hole and wasn’t positioned in the right spot, I made that look really hard! 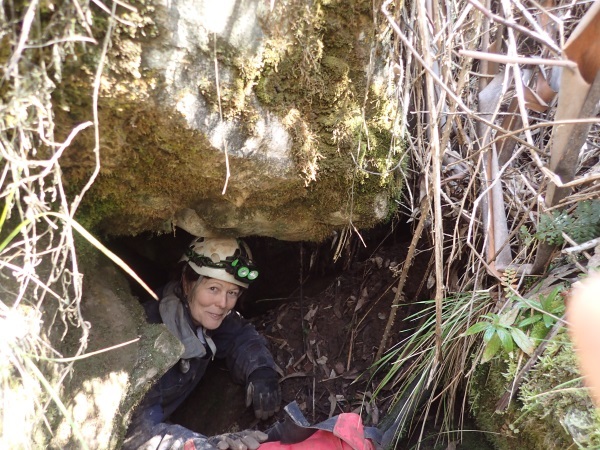 Back up the slippery mud slope and out into the sunlight – Heather exiting the cave. 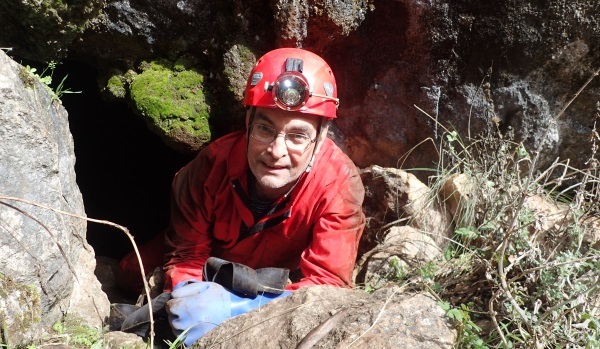 Steve exiting the cave – this was his first wild cave in forty-odd years. 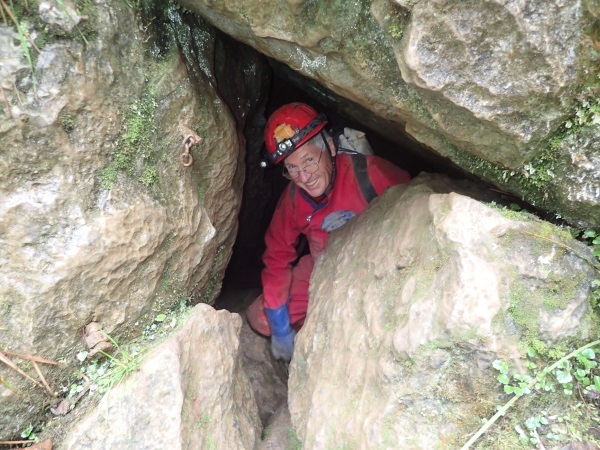 Caving’s a little different now to when he did it with hemp ropes and probably no helmets or overalls! A slog up the hill to our cars and then back to the West Wing. Chantelle set off for home in Tumbarumba, and Regina set off home to Talbingo. David, Steve, Heather and I took a walk down to the thermal pools and had a very short dip (not very warm), then back to the West Wing for happy hour and a great smoked salmon and dill pasta prepared by Marcia. I introduced Steve and David to the card game May I? – Heather is an old hand thank goodness because every time I changed the rules of the game (the object of the game changes with each hand), she confirmed that I wasn’t trying to make things difficult for them. 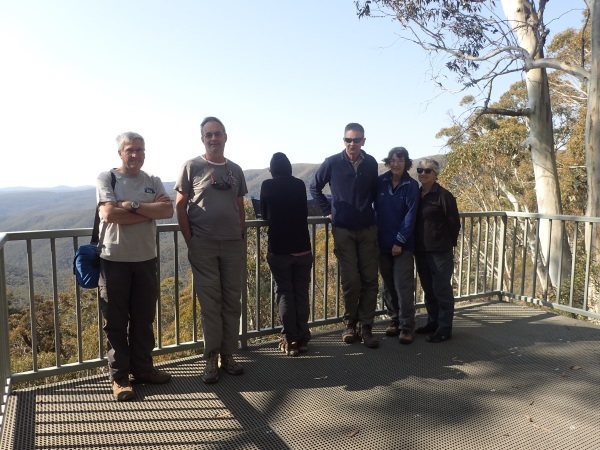 Monday Steve had a rest day and we visited East Deep Creek (Y5), with Regina, Marcia and Heather. 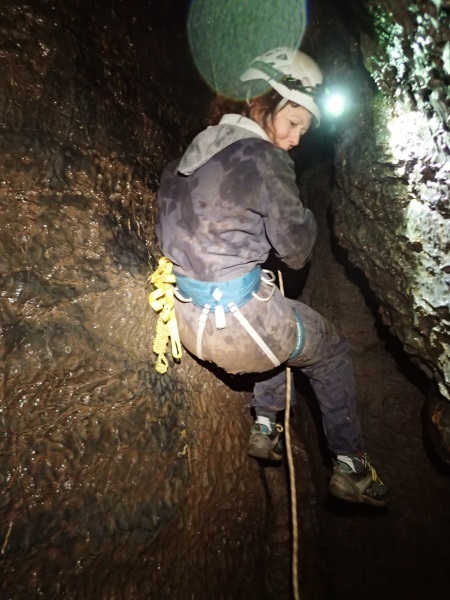 Marcia and Heather were introduced to rules of “clean zones”, where you have to take off your overalls and muddy shoes, and put on some clean shoes (like crocs) to go into a part of the cave that has pristine white flow stone. 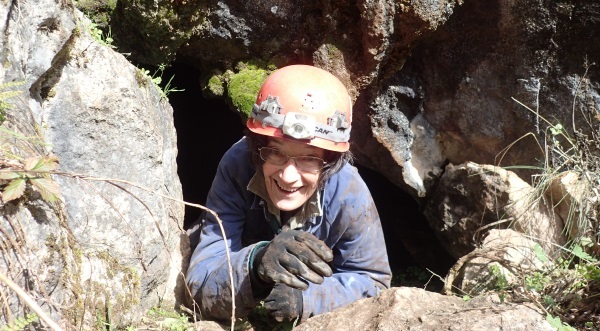 You enter the cave and walk/scramble through a rock pile (with a few large caverns) and then get to the gate (Marcia climbing through). It has to be the hardest gate to get through and locking it is even harder. There’s a gaping chasm underneath you and you feel like you’re going to drop into it as you slide yourself past the gate, that bloody bar gets in the way too. Going back is a little easier although the last person has to crawl through a squeeze for a couple of metres, turn around and then go back in to padlock the gate. Regina just at a climb-down after a squeeze. And then there are some climbs. At the Crystal Pool, you have to belly-slide through a slot making sure not to dislodge stones into the pool. The bank has eroded considerably and you now can’t avoid stepping down to continue on to where you can stand up. Last time I was here, the water was about 7cm higher than it was on this day (evidence of drought conditions). After the Crystal Pool there is a small 2m climb which can be tricky but we all made it up without incident. 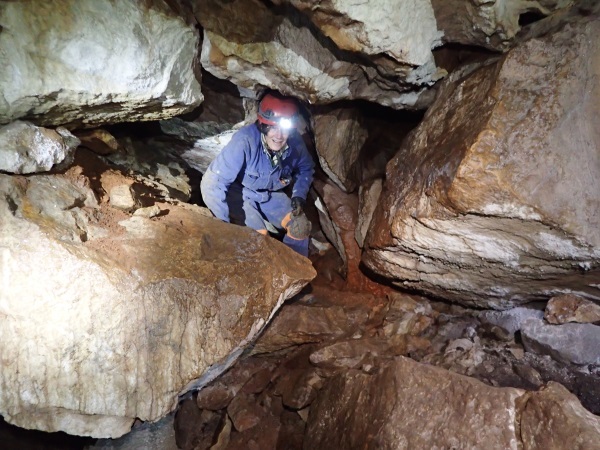 Whilst we were in the clean area, Regina went off looking for the carbide lamp of a caver who had been lost for 3 days in East Deep Creek many years ago. 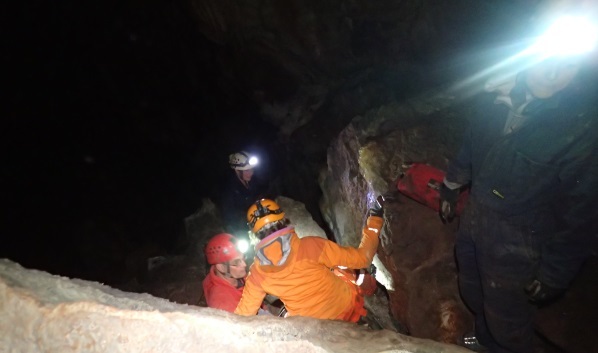 Apparently he’d gone in there with a friend but then the friend said he was heading out and the other caver became disoriented. He existed for 3 days before being found, he kept returning to the Crystal Pool to get drinking water during the 3 days. Regina thought the missing lamp might be in this area, but we didn’t find any evidence. So much time has gone by, someone’s sure to have picked it up years ago. 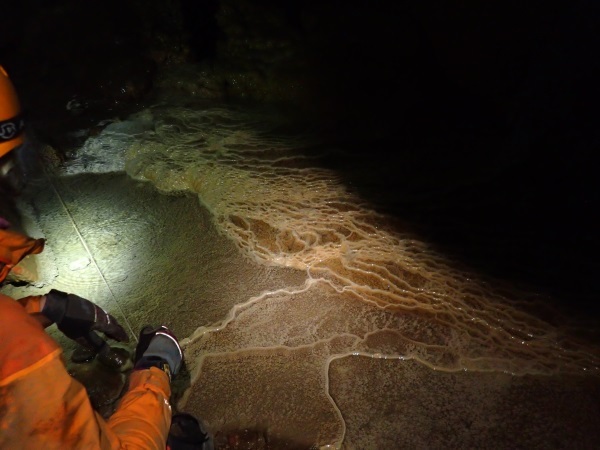 In the clean zone, note the really white formation in the bottom of image. 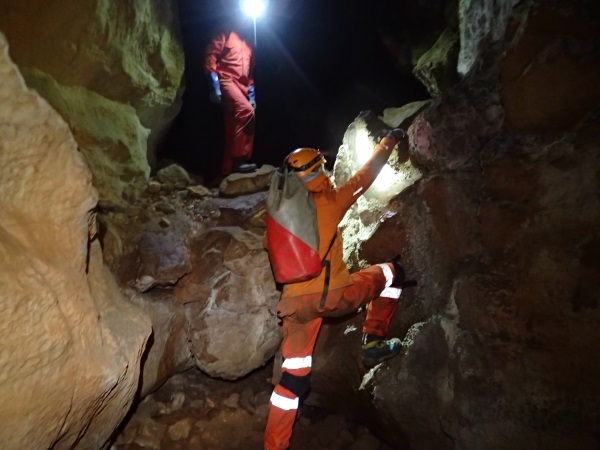 Still in the clean zone, David pointing out a feature to Marcia. 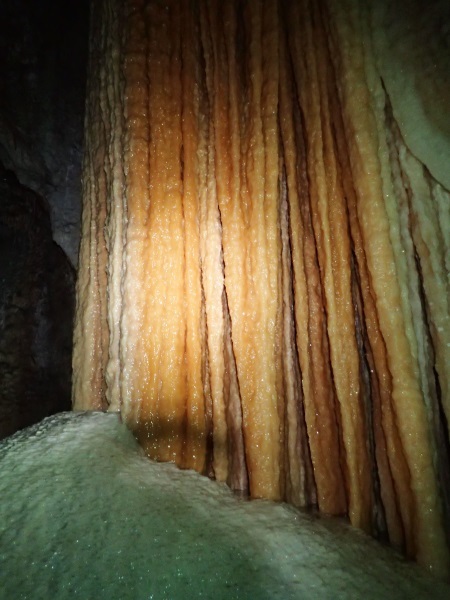 More white formation. 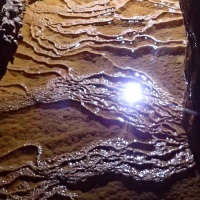 There was a lot of water running over the flow stone, so much that you could see ripples. Heather at the end of the clean zone. Once back out of the clean zone, we packed up and headed out. 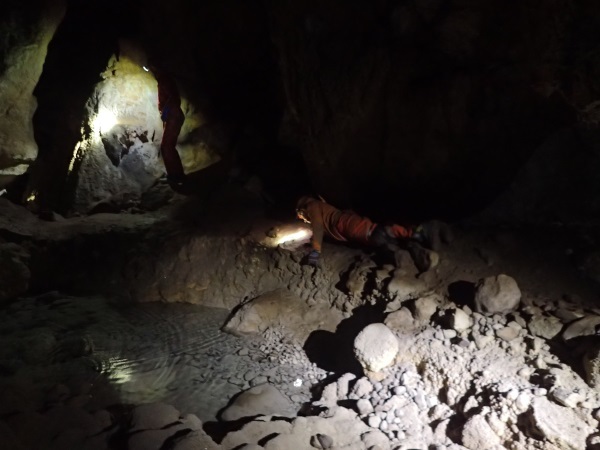 We had come across some cairns that other cavers had built (why you would need them is beyond me), so we dismantled them on the way out. Back in sunlight and we headed up to the cars. Back at the tourist precinct we changed from the West Wing to the East Wing where we all had our own rooms (we had had to share for a couple of nights). Marj and John from CSS joined us for happy hour and dinner that night, John was to accompany us to Eagle’s Nest on Wednesday. My turn for cooking and we had Chicken & Grapes (my signature dish). 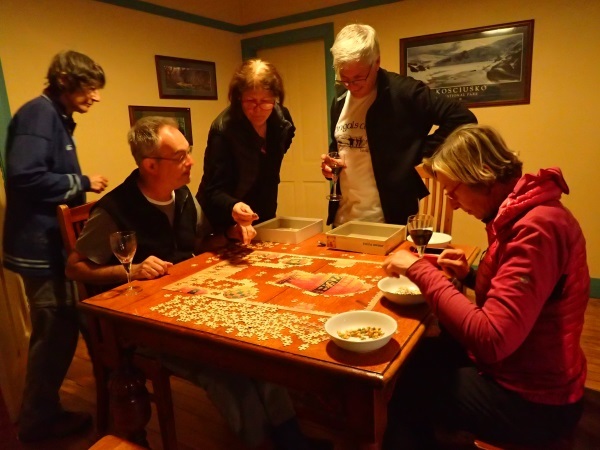 After dinner, someone had the bright idea to do a jig-saw on Monday night, which in itself was a great idea, it was just the choice of jig-saw that was ill-advised, too many pieces the same colour – it took us three nights to complete! 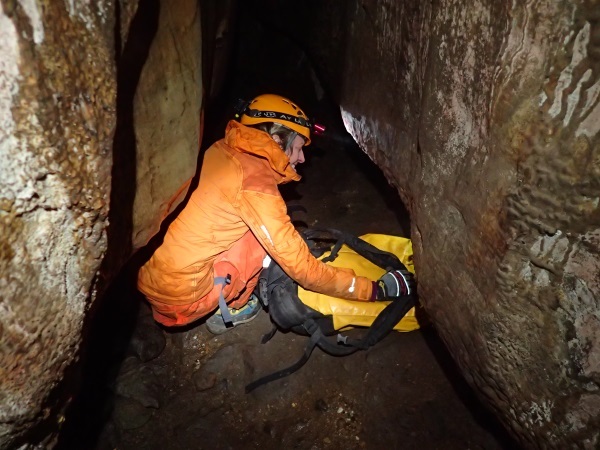 The table was the right size but the light wasn’t at all good, eventually we got out our caving head torches so we could get a better idea of the different shades of cream! 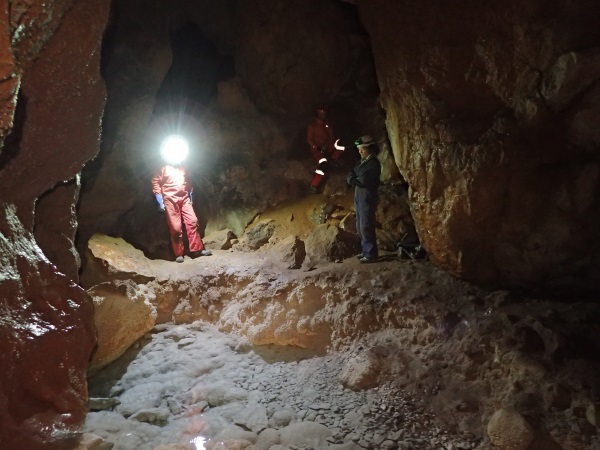 John’s concern is that the tailings from the tunnel will be dumped in an area where endangered bats are roosting in abandoned mines, so we were on a mission to see if the bats were still there. My bright idea was that they just should close Selwyn Ski Resort down for 5 years and dump all the tailings there, making the mountain higher and improving the ski fields, why no-one’s thought of this is beyond me, seems logical. Even though Snowy 2.0 hasn’t officially been adopted, there’s much work going on in anticipation of approval. We had to pass through multiple check points to get down into the valley. At the end of the line (before the ford over the Yarrangobilly River which was too high for us to cross) we came to these “ruins”, an earthen walled Inn that was used in the old copper mining days – all that’s left is the eroding walls. 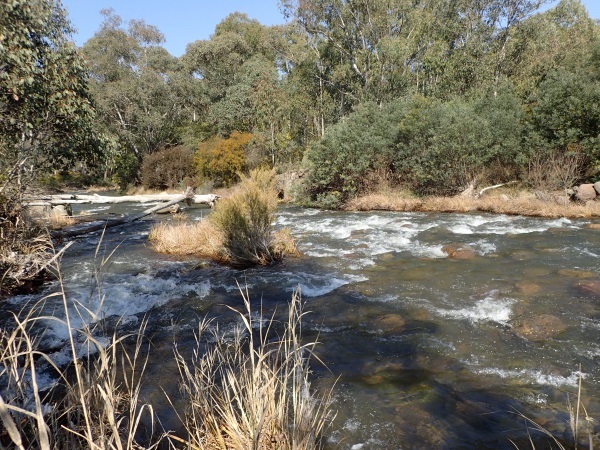 Yarrangobilly River, the level is high due to snow melt. 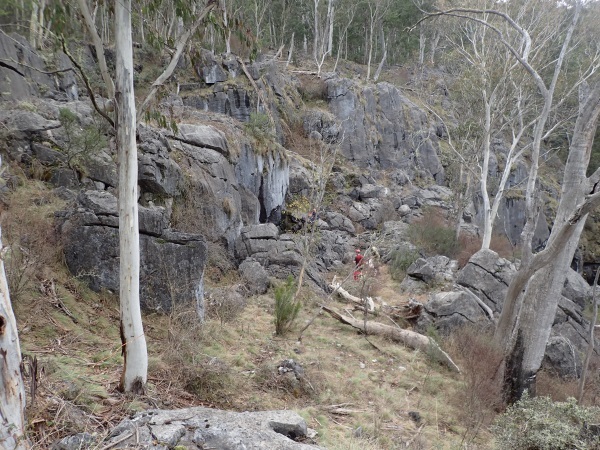 This is downstream of Caves House and the Karst precinct. 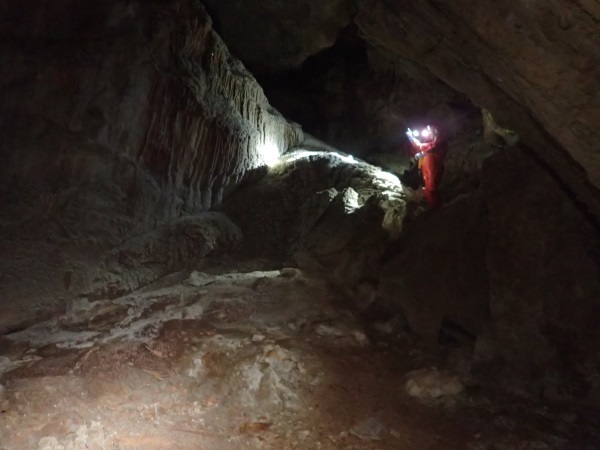 We easily found the old mine that John expected the bats to be in (there are numerous abandoned mines in the area). 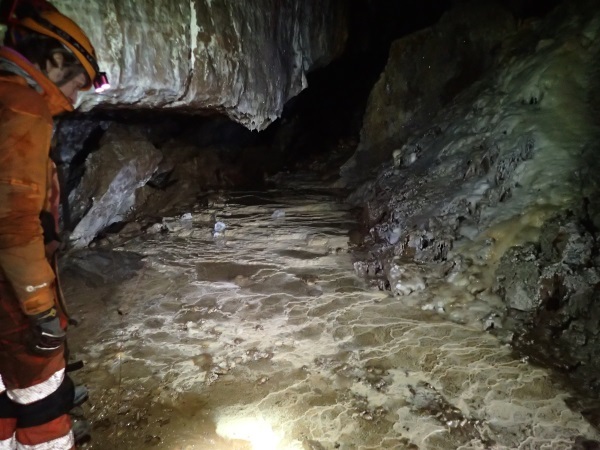 We all went in to have a look, although we didn’t see any bats, there was some evidence of bats in the mine, just a few droppings, but given that the floor was mostly water, there wasn’t much scope for deposits to build up. 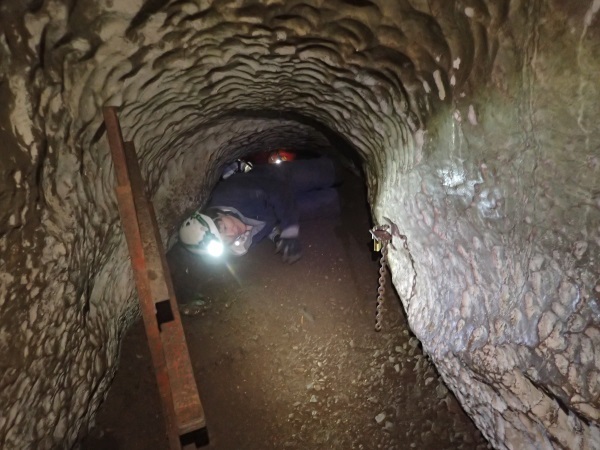 John went in to the end of the mine (there would have been more but there’s been a rockfall closing off the rest. 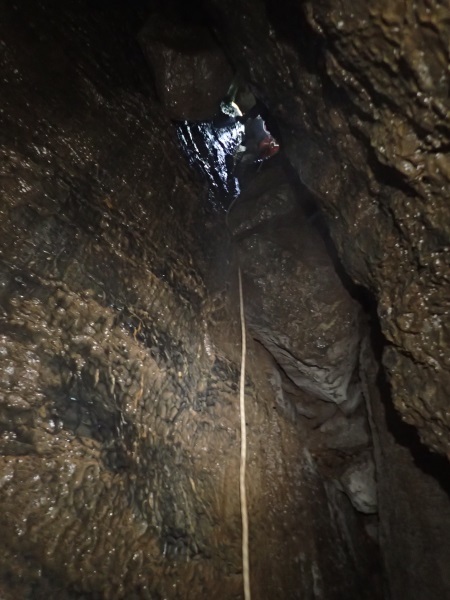 He had to chimney across as there was a very deep (manky) pool in the bottom of the shaft. Back on the road we stopped at this look-out to admire the view, very windy though so we didn’t stick around long. 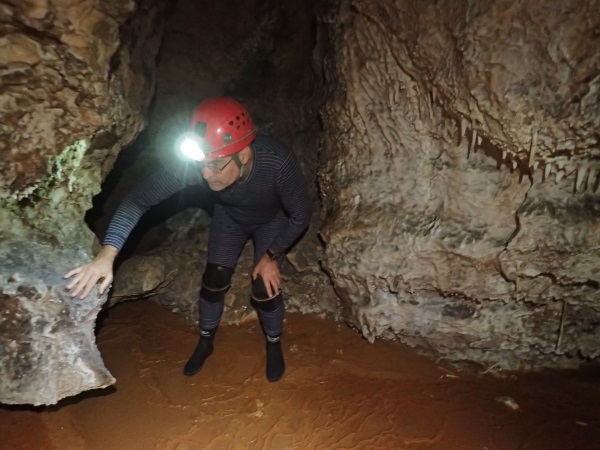 More happy hour – I could get used to this sort of caving! 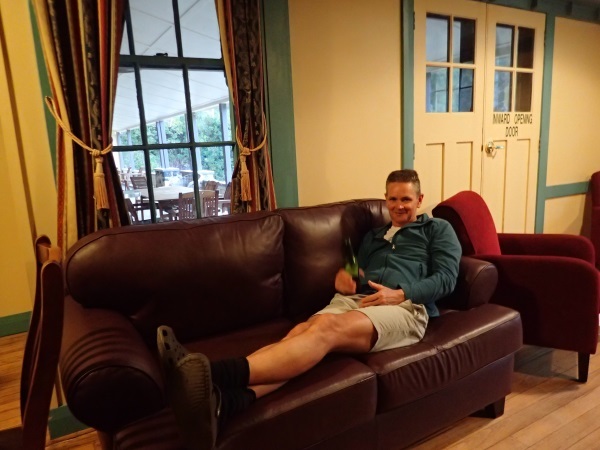 Steve chilling out with a beer. David was on dinner duty this night and cooked a yummy Shepherds Pie. Back to the jig-saw and another game of May I? 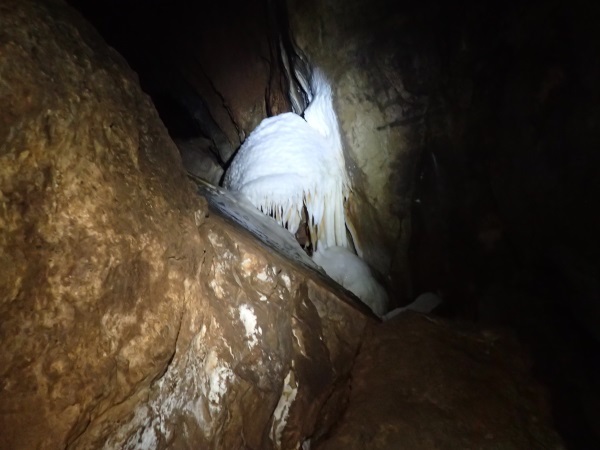 Wednesday – This is the day of caving that I’d built up for everyone, a full 4 – 5 hours under ground with some amazing formations – Eagles Nest (Y2 – Y3). 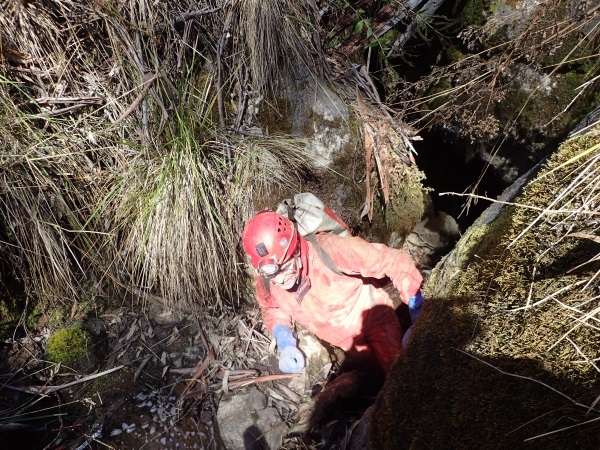 I was ambivalent about doing Eagles Nest, the last time I did it, I got through Hughies Dig and am pretty sure I said “never doing that again” and here I was back for a second go at it! Maybe I’ve done worse squeezes since the last time (Cooleman Cave) or maybe I’m just used to squeezes now, as it wasn’t that bad at all! The walk in was longer than the last time I did it (we had the key to the locked gate that time), but it’s an easy walk with minimal scrub and off-track navigation, both John and David know the route in like the back of their hands. Gearing up at the entry to Y3, we would be exiting at the entry to Y2. 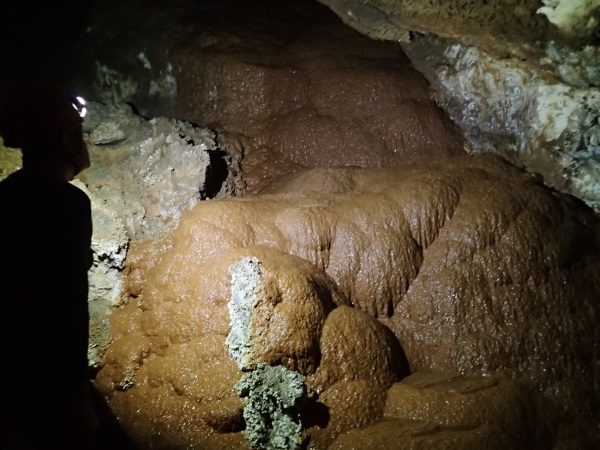 Eagles Next has something for everyone, it’s sport (lots of climbing scrambling and crawling) and has some amazing formations. 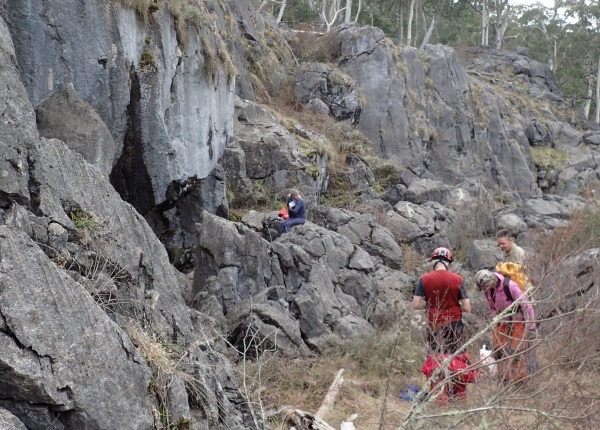 The first half is all rock fall, so lots of scrambling. Steve coming through a squeeze, I was worried that Steve wouldn’t like it because he’s too tall for the squeezes and crawls to be comfortable, short arse me just wriggles through! Another scramble just before the non-pitch. What David calls the non-pitch, a 6m abseil with a chock-stone in the middle of it, we elected to lower the packs down on the end of the rope because everyone gets their pack caught on that chock-stone. Heather on the abseil (at the end, everyone was too fast for me to get a good shot). David being last, came down on a double rope and just wrapped the rope around his forearm a couple of times and abseiled that way (without a descender). After the non-pitch there’s a nice stream-way, a relief to walk upright after all the scrambling. Looking back in the other direction. I love the scalloping of the rock which is caused by the water flowing through the stream-way. David’s already gone through and unlocked the gate at the end of Hughie’s Dig. 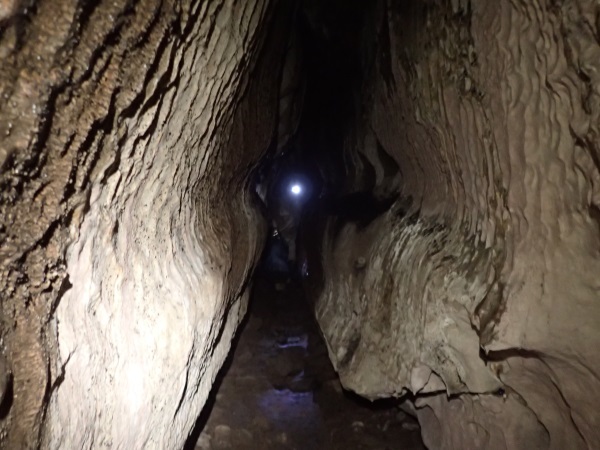 This passage was dug out many years ago to join the two caves together. Marcia preparing to go in. And she’s off, you sort of have to inch your way forward pushing your pack (or trailing it after you hooked onto your foot which I found most unsuccessful). I had a better pack this time (a caving pack) and it was way, way easier than the last time. Also, it’s hard packed dirt as a base, no dust to contend with. Heather at the end just before the locked gate. It is much higher at the end than at the beginning. Following Hughie’s Dig there’s a lovely stream-way passage. 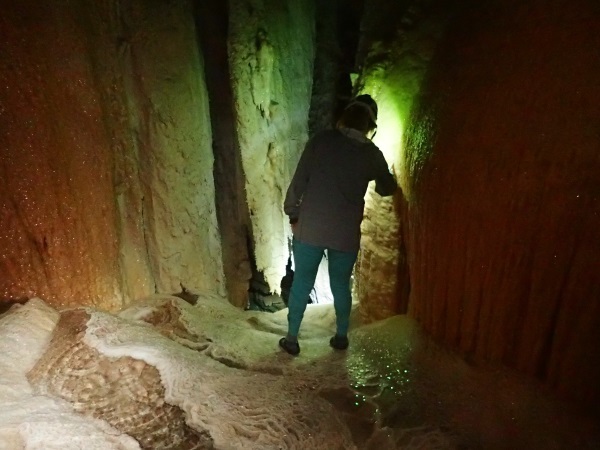 More of the passage which eventually leads us to the Red Crystal Room. 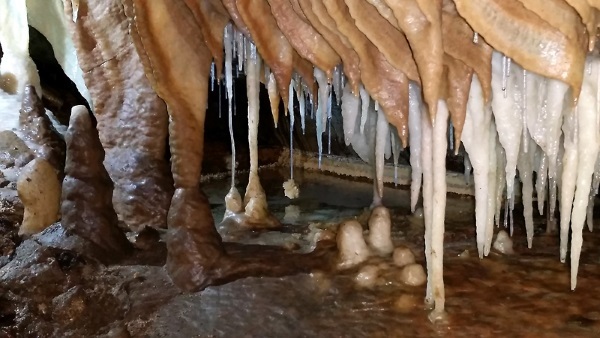 We had lunch at the Red Crystal Room, surrounded with a lot of formations that are orange in colour. Another snow white formation in the Red Crystal Room. There were more streamway passages, this one with lots of rim-stone pools, and a marked track so that you didn’t destroy any formations. 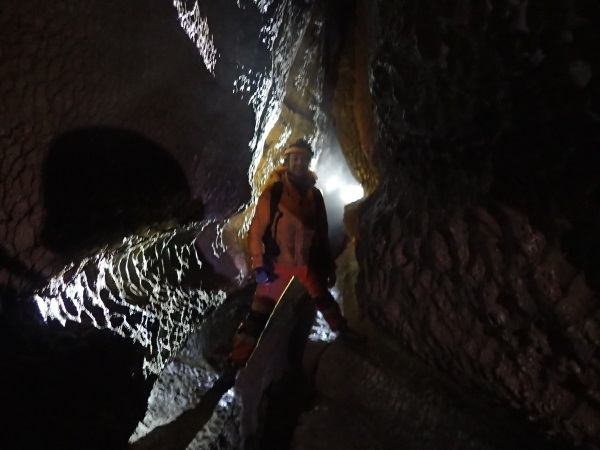 You can see the string denoting the track in David’s head lamp and the pools of water. 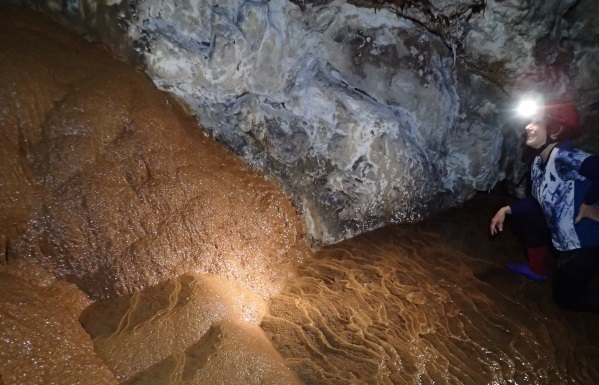 Marcia’s looking at a primary formation (I think) formed when the streamway was active. This is one of my favourite spots, a patch of primary formation, the Dragon’s Teeth. This is a much better photo of the Dragons Teeth, taken by David many years ago. My photos just don’t do it justice. It’s an amazing patch of primary rock eroded by the river that must have flowed through the passage way thousands of years ago. Almost at the end now, in a flat area, these straws were just hanging off the rock, some of them are like donkey’s tails. 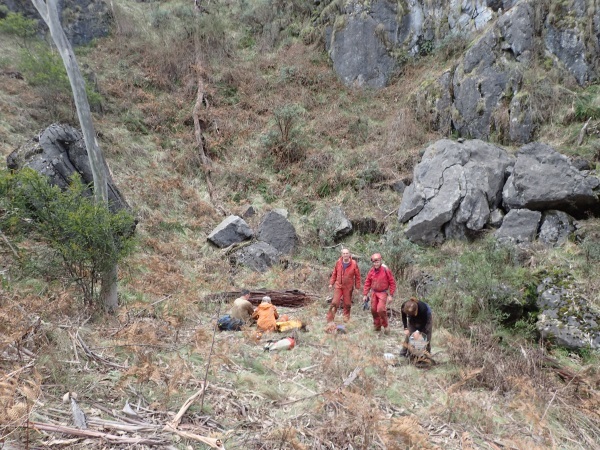 We were soon at the route out, a rock pile that usually has water flowing down from the top. On this occasion it was bone dry. No photos taken from now on, I was too focussed on following David through the maze of rocks and negotiating my way across gaping chasms and up climbs that were bigger than I’m comfortable with; I baulked at one spot but David talked me across (another gaping chasm!). David unerringly negotiated his way through the rock pile, don’t know how he manages to pick the right route and then sooner than I expected we were up at the daylight hole and out into the sunshine. John B exiting the cave. 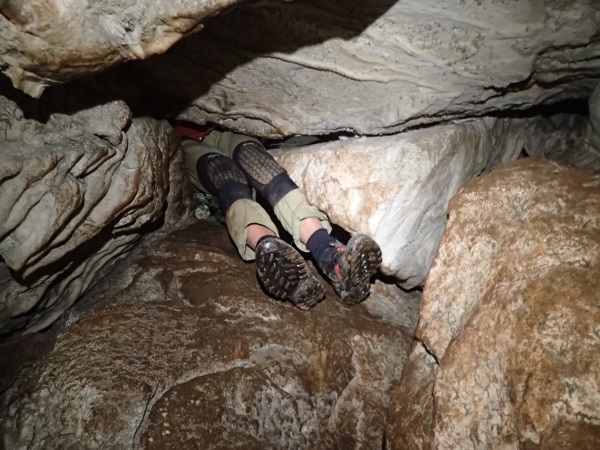 Out of the cave and I had to find a tree quickly, four and a half hours without peeing is a stretch, I did have my pee jar with me but didn’t really want to use it! The smiles on everyone’s faces were a sight to see, the highlight of the week I think. The walk out was tedious after such a big day but we were soon back at the cars for the drive back to the precinct. Leftovers for tonight’s dinner (no-one had to cook after such a strenuous day) and then we were back into the puzzle. Marj and Regina stayed up until around midnight they were obsessed with finishing it. 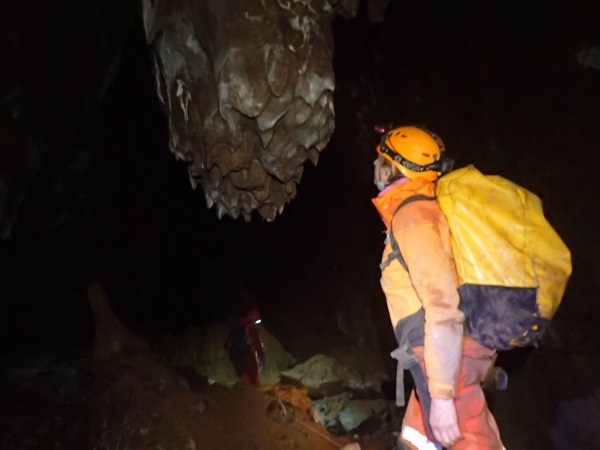 It was still unfinished when we got up the next morning but with a supreme effort we got back into it and it was finished before we went off caving again..
On Thursday we had a lazy start and we all seemed to go our separate ways. Steve rode 70k on his push-bike out to Blue Water Hole and back. Marcia did a few tourist caves, and David, Heather and I went to visit Old Inn Cave (Y10), one I had missed out on the last time I was here. 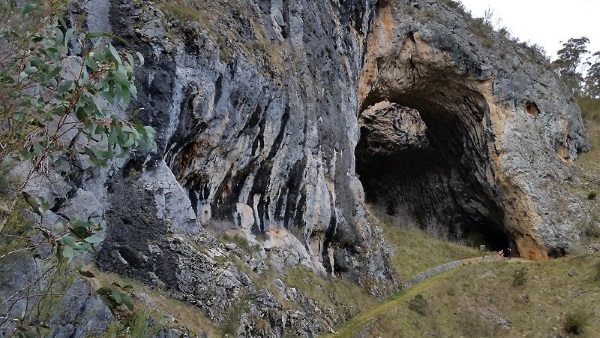 Easy to get to this cave, it’s really close (and I mean really, really close) to the highway. However, the place is infested with blackberries the closer you got to it, the thicker the blackberries. 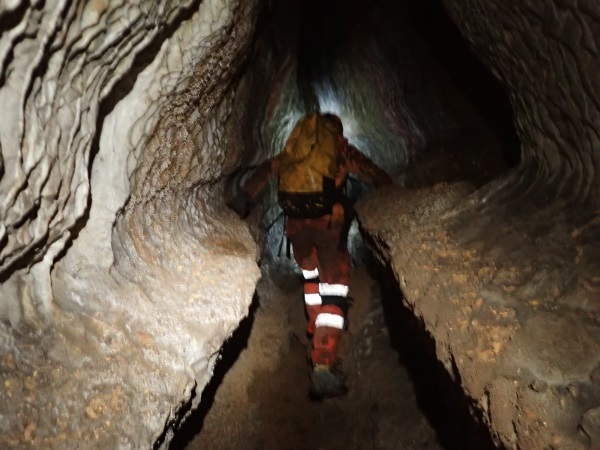 The route into the cave is interesting, down a slippery log with some foot wedges cut into it (didn’t do much for Heather and me, it was still way slippery). There was a bit of rock scrambling through a rock pile and one particularly nasty step across that I avoided by climbing down and up again (didn’t think too much about getting back, maybe I should have). And then we arrived at the clean zone where we changed out of our overalls and muddy shoes and continued on. 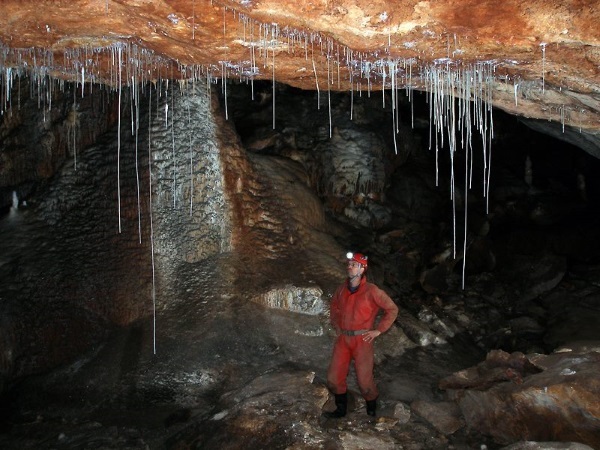 For a small cave it is quite highly decorated, lots of rim pools in the stream-way. The best shot I took all weekend, David in the stream-way. a bit of flowstone, at the end, it was actually quite muddy in this area, not sure why it’s a clean zone, or maybe the walls weren’t as muddy a few years ago. 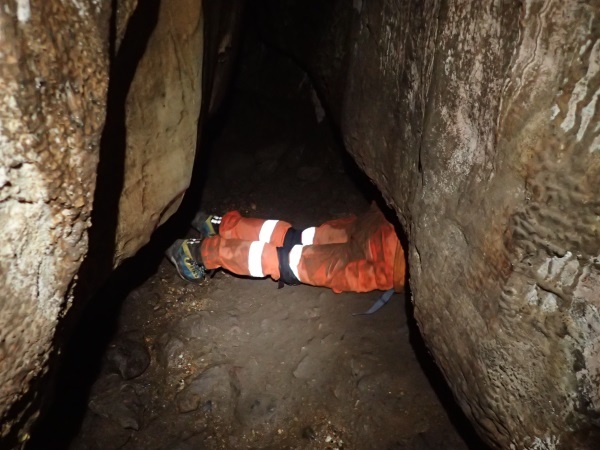 David thought I should have a shot of me in the cave, so here it is! 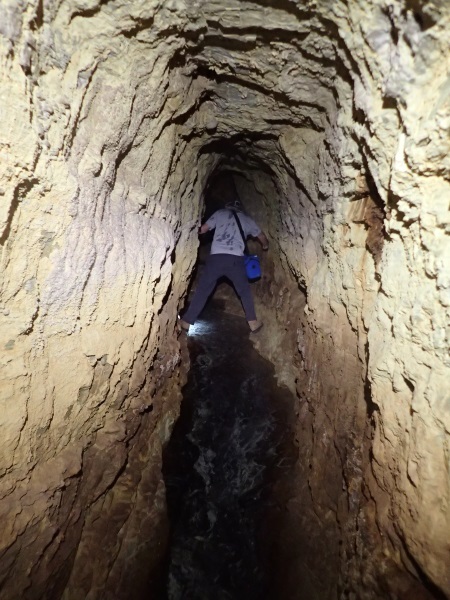 The way back was pretty straight forward except for the step across the gaping chasm, David very kindly offered me his hand so he could pull me across, the step-over was almost enough to turn me off going into this cave again! All in all though quite a pretty cave considering how short it was, we were only there for an hour or so. David took the conventional way out (up the slippery log) grunting quite a bit. 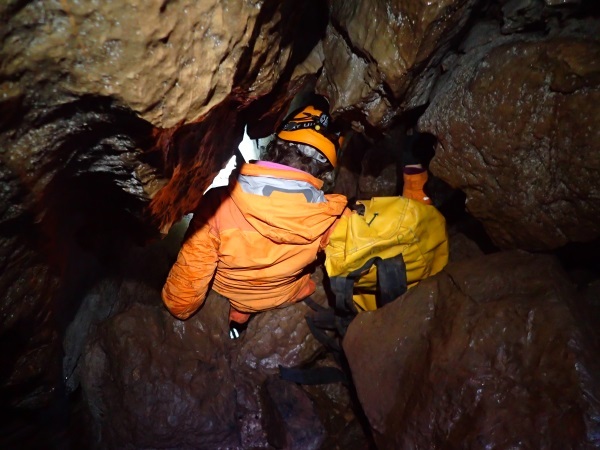 Heather and I took the easy route, through a small hole in the rocks! We then took a little detour to look at Cotterill’s Cottage where David reminisced about the many weeks MSS cavers camped out at the Cottage when they caved at Yarrangobilly. 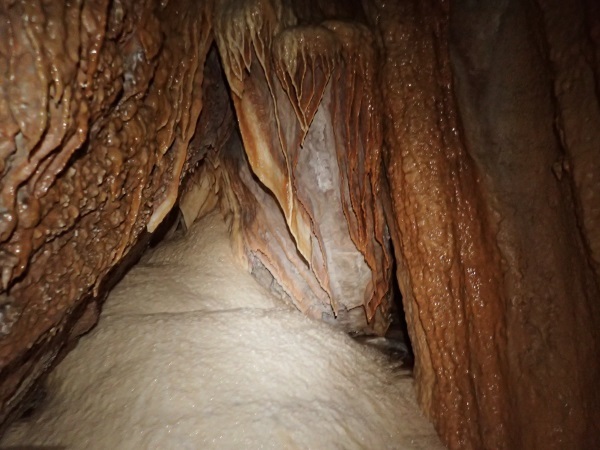 We met up with Marj and John for lunch and then went to look at Leak in the Creek Cave, which is a cave in progress. I cooked a lamb roast for our final night at Yagby and next morning we packed up for the long ride home. So, I’ve been to Yagby now three years in a row (for one reason or another). 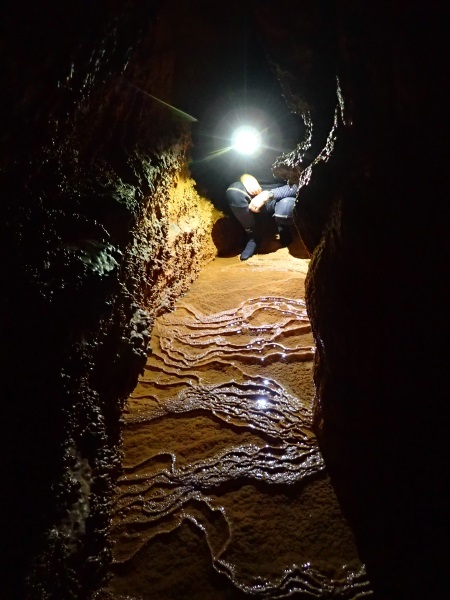 I might leave it a year or two before I go back, or maybe I should start a list of the caves I want to do there next time (lol)! 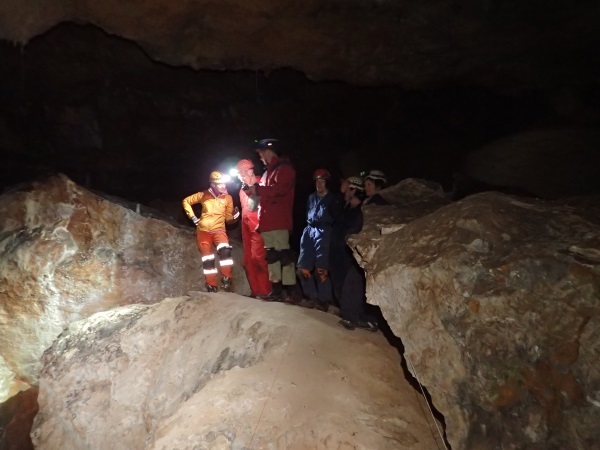 Thanks to everyone for making the week such a success and a BIG thank you to David who guided us through all the caves. 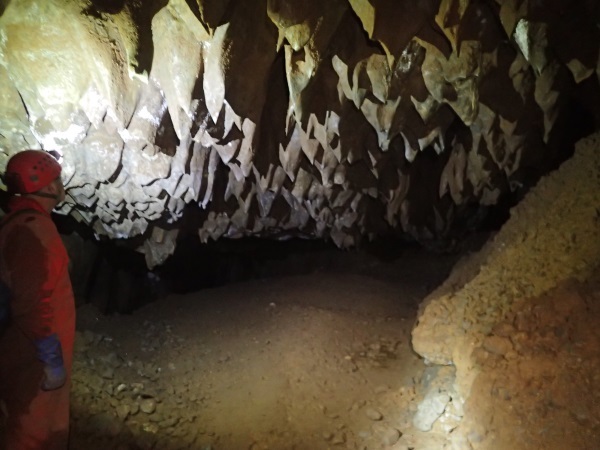 This entry was posted in Caving, MSS. Bookmark the permalink. Wow Looks amazing! Thank you so much for all the beautiful photos! Thanks Jen, sounded like a full-on weekend but it was actually quite relaxing! 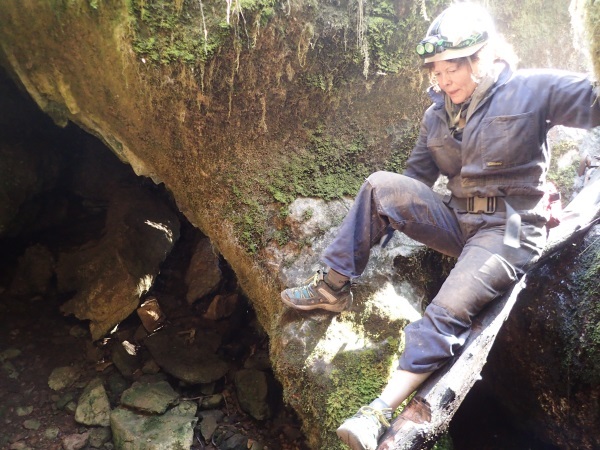 Marilyn’s energy and passion for these adventure activities continues to inspire me. What she fails to mention is that after being so apprehensive about Hughie’s Dig, she now regards it as one of her favourite parts of the cave! A line from Flecker, which I’ve read elsewhere, sums up her attitude: “We shall go…always a little further”. 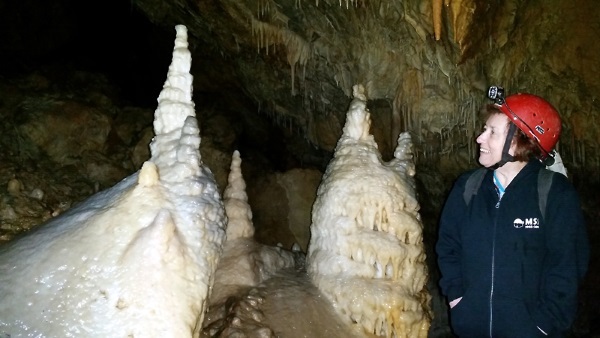 Great trip, great people, great caves! Ah David, that’s so nice! Yes, “always a little further, it may be beyond that last blue mountain” sort of sounds like he’s talking about one of my walks. Or me talking about my search for a grassy meadow campsite! Thanks to Marilyn and David for organising a great trip. Looking at me in that squeeze looks like a semi trailer doing a u turn in a back street. Ah, it’s not that bad Steve, you did look funny coming through though!